On Thursday, August 27, 2015, then 6-year old Walker was taken to his pediatrician for what was expected to be a normal annual exam. Instead, Walker’s parents left the appointment devastated and in shock with the diagnosis of a brain tumor. That night, Walker and his parents were life flighted from Bozeman, MT to Children’s Hospital Colorado. 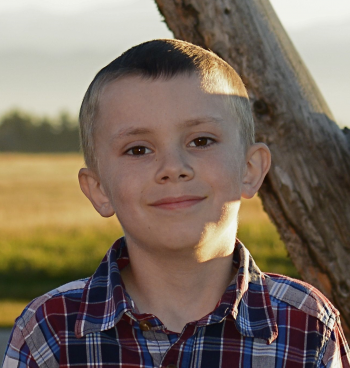 On August 31, the tumor was removed, but weeks later, they were thrust into their second-worst nightmare: Walker did in fact have a malignant medulloblastoma. The tumor removal, although successful, left Walker with some difficult side effects. First, Walker suffered from a mild case of Posterior Fossa Syndrome during which he was mute and very agitated. For weeks, he wore a patch for double vision because his left eye was weak, making it difficult for Walker to walk and use his left arm. After nearly a year of treatment, including 31 rounds of radiation to his brain and spine and 7 brutal rounds of chemotherapy, Walker began walking and talking again, and getting back to a new normal. Luckily, there is HOPE in Walker’s story. Walker’s most recent MRI resulted in a clean scan that showed no evidence of disease, the best thing anyone could have asked for! One of MAF’s favorite docs, Dr. Foreman, provided even more good news with the announcement that Walker’s final chemotherapy session in Denver will be in September, instead of October. For now, Walker is home in Bozeman and we wish him all the best with his remaining treatment.